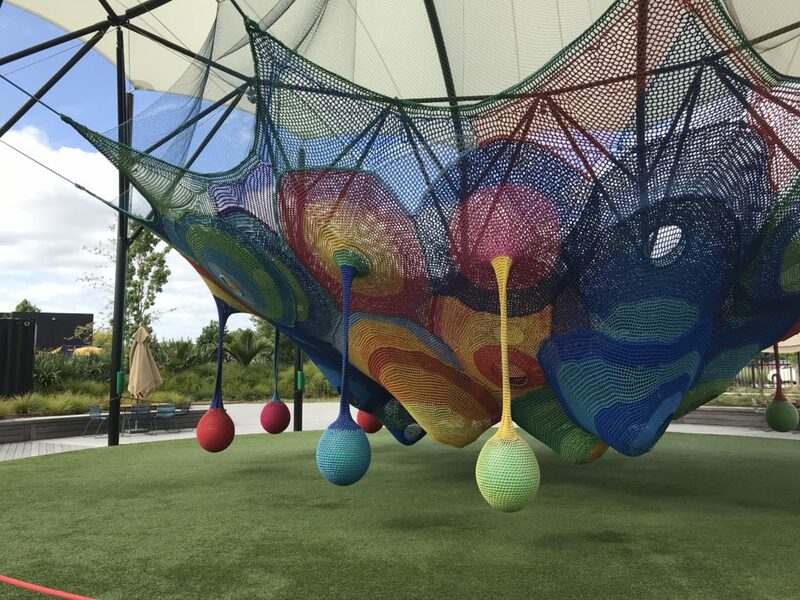 Trying to find some great locations to spend a day with your kids in Auckland? These are our family favorites and recommendations on how to spend the day. Whoa! studios is out in Henderson (West Auckland). This is a new discovery for us, but certainly somewhere we will be going again. We got here early on a Saturday morning as the park opened at 9 am and it wasn’t very crowded. They have a great adventure playground for the kids and is a good way for the kids to exert a bit of energy. At 11 am they have a live show in the main theatre. This is a mixture of puppetry, liver performance and pre-recorded video that combines together to create a 50 min show. At the time we went, the show was called ‘Custard of the Caribbean’ which the kids thoroughly enjoyed. The show seems to change very few months. Following the show we headed into the restaurant for lunch. This seems to be a stand alone restaurant called The Grounds within the same property . The restaurant had fantastic food at reasonable prices. I would certainly recommend stopping here for a meal if you are ever in the area. 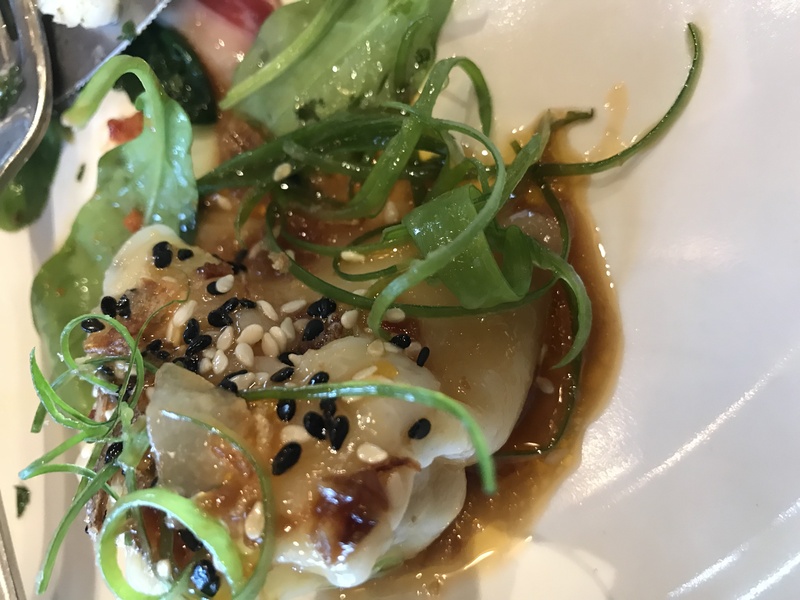 The restaurant – it is run by Ben Bayly (judge on My Kitchen Rules) and Mike Shatura. Both are well know premier chefs who have worked in other well known Auckland restaurants such as the Grove. Both kids really enjoyed the food as the menu caters for the whole family. The 4 year old had the buttered pasta: ‘ it was delicious’. 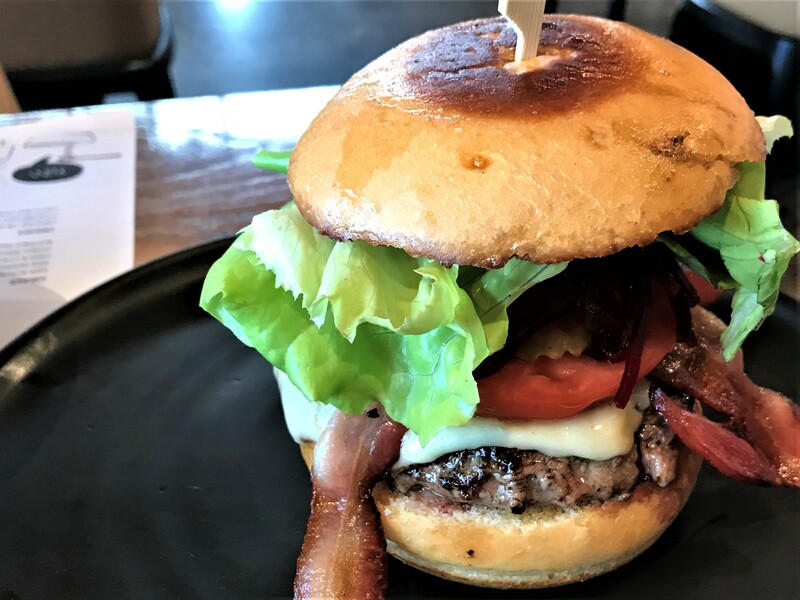 The 6 year old tried the adult food – but particularly ‘loved the burger’. Mission Bay is a well know beach in the Eastern suburbs of Auckland. It is well developed, with a nice beach boardwalk, large children’s playground, plenty of grass area to have a picnic, plenty of great restaurants and a movie theater. 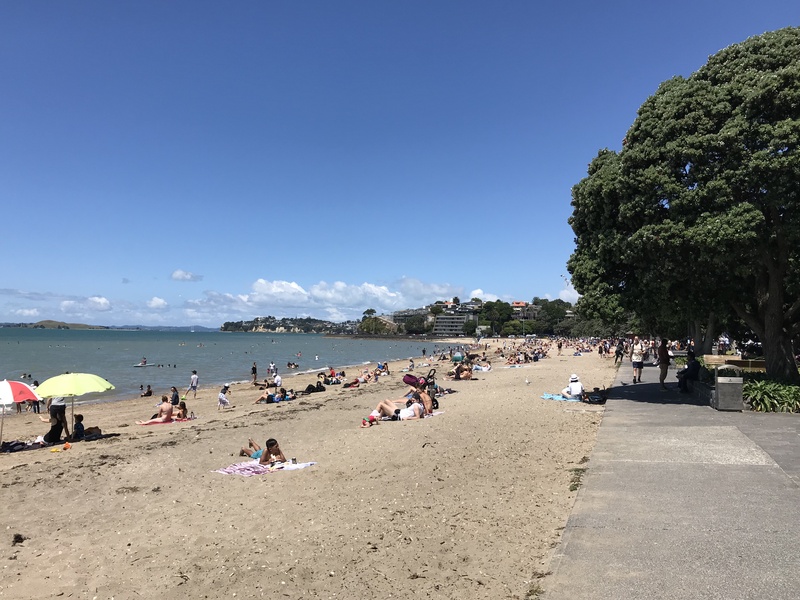 Mission Bay beach, Auckland on a warm summers day. I would recommend that you get there mid morning to spend some time on the beach and for the kids to play in the sand or in the playground to work up an appetite. Remember to take appropriate sun protection. Go for an early lunch – our personal favorite is Portofino’s. They do $20 lunch specials that start at 11.30 am. After lunch, head to the Berkeley Mission Bay movie theater for the latest flick to spend a lazy afternoon. 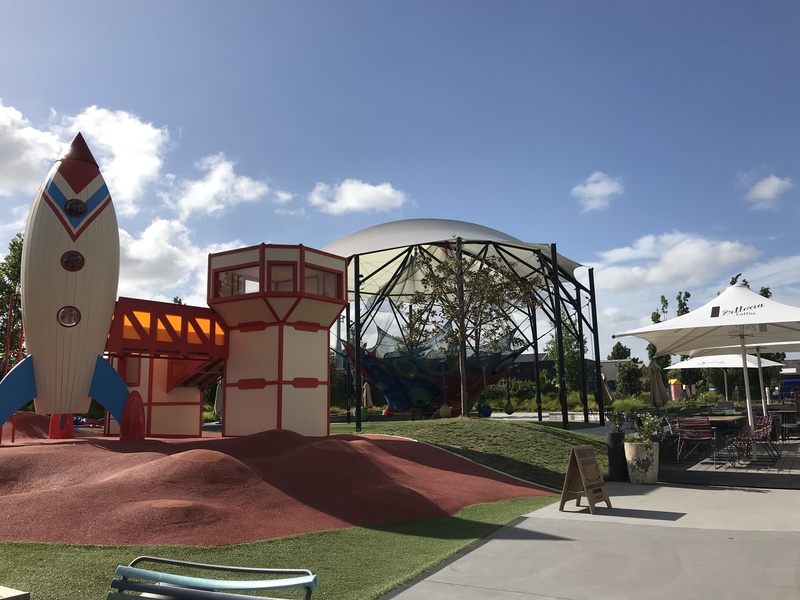 This is the New Zealand’s main theme park. All kids, including the adult ones love this place. Something for all ages. There is an area for the little kids called ‘Kidz Kingdom’. Can get a bit busy during school holidays and sunny weekends and during these times you may have to line up for 15-45 minutes for some of the popular rides. 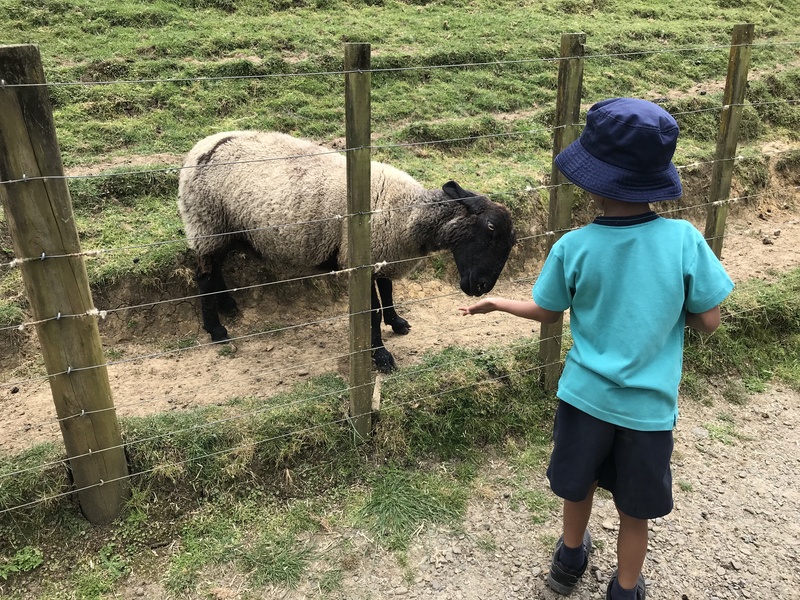 It is the most expensive option on the list – entry prices for a family of 4 with 2 adults and 2 children will set you back about $NZ 200, but really what you would expect to pay anywhere in the world for this level or theme park. I would never have know about this place if it wasn’t for my sons school trip. It is also out in Henderson, West Auckland. It is a very unique New Zealand farm experience. 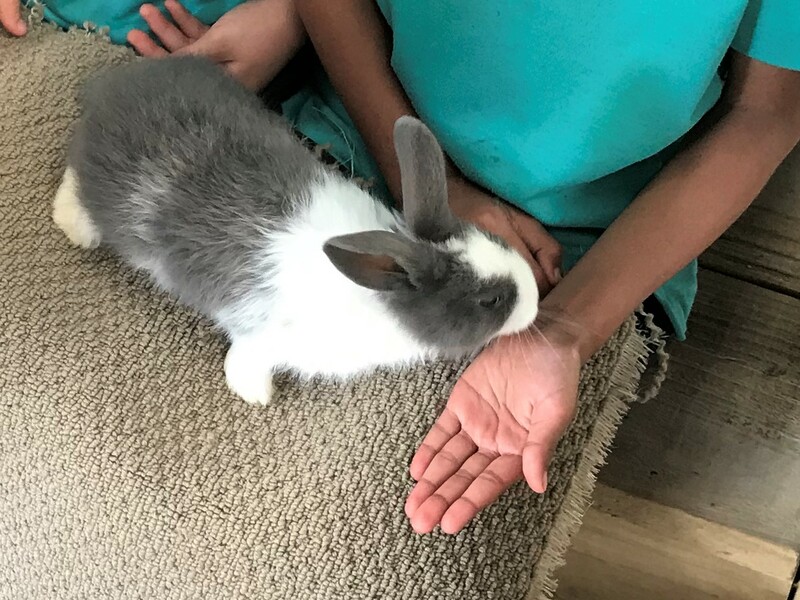 The kids get to do horse and pony rides (as many rides as they want), pet animals such as rabbits, guinea pigs and rats, feed some of the larger animals (sheep and chickens), and also get to do a tractor ride. They have a maze for the kids to make there way through that ends in some caves which they can explore at the end. It is open 7 days a week during school holidays, and Wednesday to Sunday during the school year. Petting a rabbits at Kiwi Valley Farm Park. Guinea pigs and rats were also available to pet. Both of these place are right next to Auckland airport. They are owned by the same couple and entrances are from the same car park, but the entry and entry fees are separate. If you plan on doing both on the same day, go to Rocket Ropes first as you get 50% of the entry to Butterfly Creek. Rocket Ropes is essentially a high rope obstacle course. You are are fully harnessed for safety. 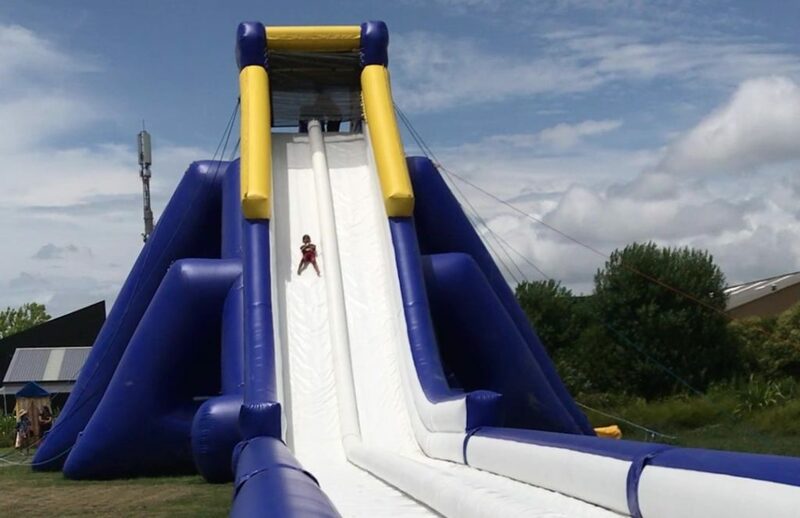 They cater for ages 2 and up and the heights of the ropes and complexity vary. There are also some more adrenaline activities such as flying foxes for the big kids, most you have to pay extra for. After the adrenaline rush, head next door to Butterfly creek. Butterfly creek is part zoo, including of course a large tropical butterfly house. It has plenty of insects, a few small animals, but also crocodiles. The best attraction though for the kids was dinosaur kingdom which had some life sized mechanized dinosaurs. You can easily spend a few hours here. There is a cafe on site with outdoor seating next to the playground, if you just need to sit down and relax for a bit whilst the kids continue to run wild. These are 5 of our favorite weekend and school holiday destinations in Auckland where the whole family can spend the day. Do you have any other great destinations for us to try? Please share in the comments section below.